Featuring durable construction and a long-handled design, the Winco BSST-13 Slotted Basting Spoon with Stainless Steel Handle, 13" is a must-have for restaurants, caterers, school cafeterias and other food-related establishments. 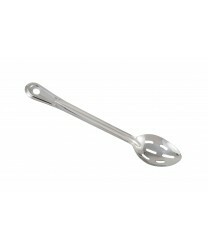 This durable cooking spoon has multiple slots, so oils, cooking liquids, dressings and marinades can drain through. The spoon has a handy hang hole, so you can store it within easy reach of your stove or oven.